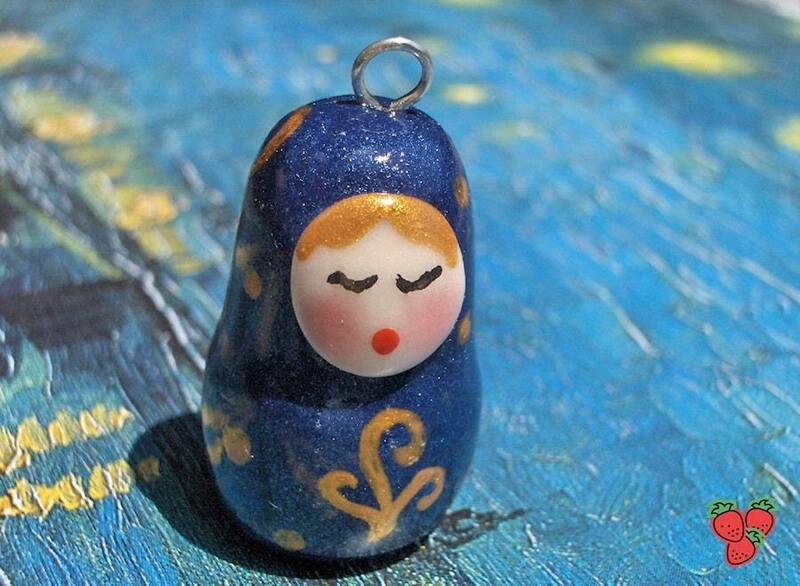 Starry Night Matryoshka, new Etsy listing! Yes, I know I should study for my exams, but in this period I have so much inspiration! But now........ 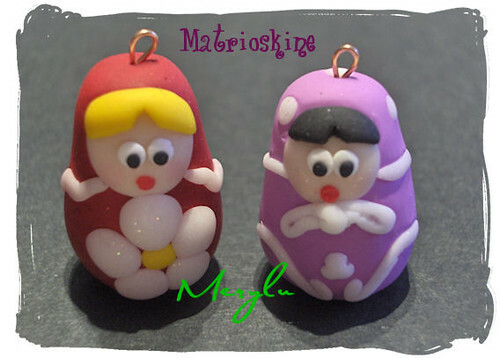 I'me very proud to show you my favourite Matryoshka, my masterpiece (anyway...I think so! =P I like her so much!). You can find her on my Etsy shop. She is a very cute charm! Her name is Starry Night Matryoshka (I've been ispired by the famous paints of Vincent Van Gogh). 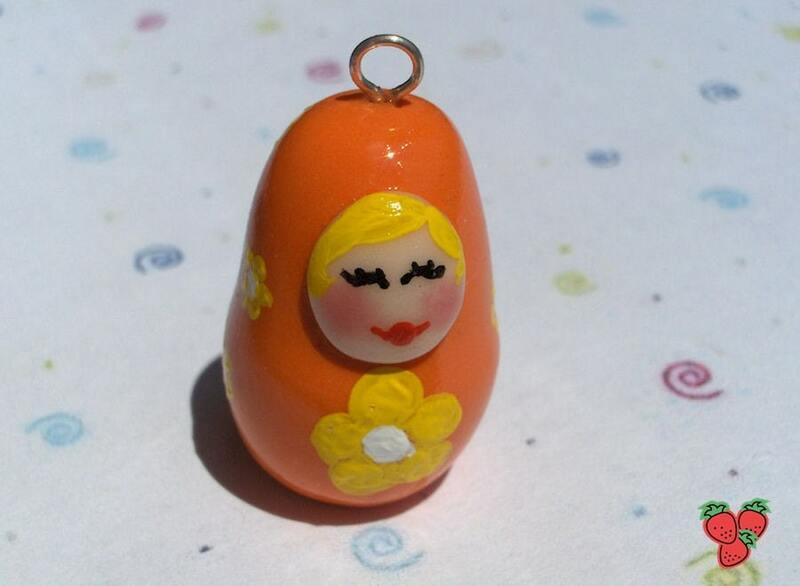 She's a pearl blue Matryoshka (a Russian Doll); the body is made of FIMO (polymer clay); the eyes, the hair, the mouth and the golden decorations on her body are handpainted by me with acrylics with love and care! It is varnished with a special gloss lacquer for polymer clay after baking. It mesures about 2,7cm, hook included. You can hang it on a bracelet, necklace, mobile, bag or anything else! If you are interested in buying and you haven't an Etsy account, feel free to contact me at petitefraise@live.it ! Featured twice in Sweet Figments' blog! I'm so happy because I've been featured twice in the great blog "Sweet Figments"! Thank you The Tiny Fig!!! 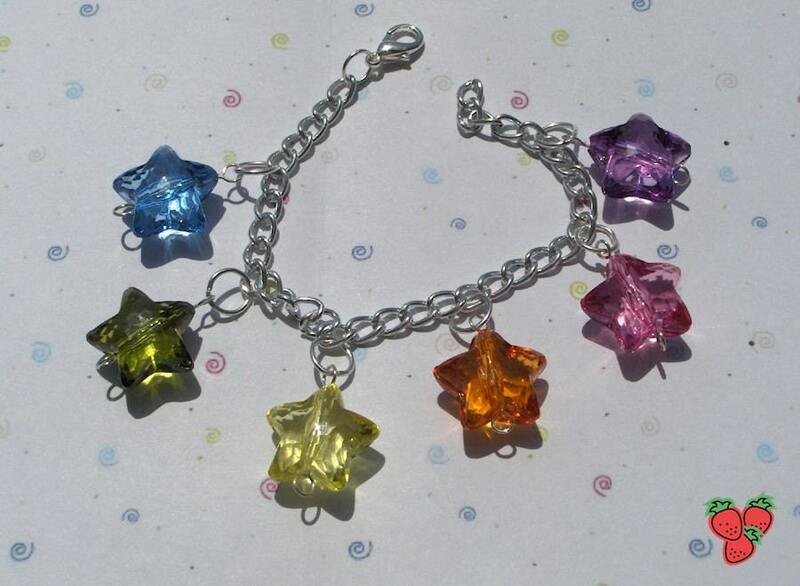 Rainbow Stars Bracelet - resin crystal charms **New Etsy listing! Hello! Today I haven't so much time, but in any case I want to show you my new Etsy listing! It's perfect for Spring and Summer! I'm very happy because the swap I made for Laura (fraeulein 2eck on Flickr) is arrived to its new home, and Laura love it! These are the photos I made before sending the swap. I must confess: I'm completely in love with Matryoshkas. Those Russian dolls are adorable! So... 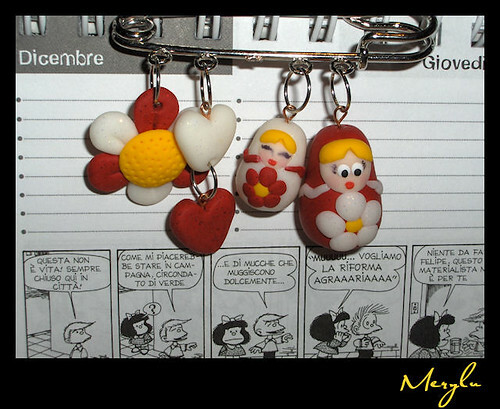 I thought, some months ago, that I could make them by myself with polymer clay! 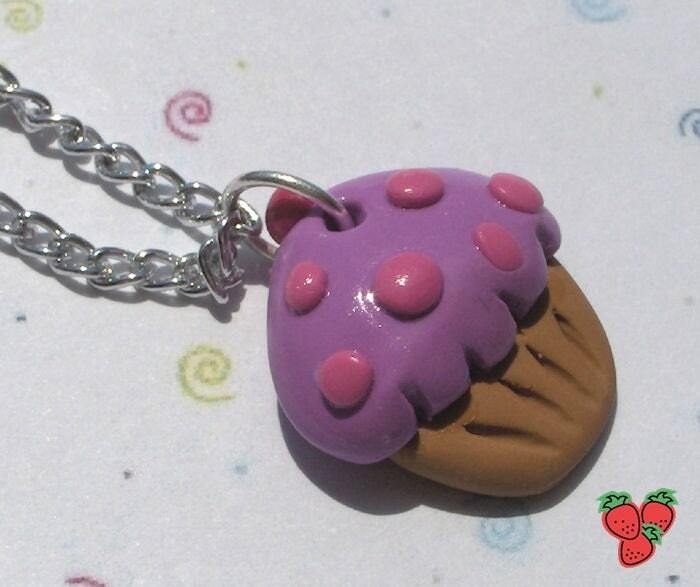 This is a very cute charm! The body is made of FIMO (polymer clay); the eyes, the hair, the mouth and the flowers on her body are handpainted by me with acrylics with love and care!It is varnished with a special gloss lacquer for polymer clay after baking. It mesures about 3cm, hook included. Here you can find some other exemples of Matryoshkas I made. An Irish Matryoshka, for Ireland lovers! On sell on my Etsy and DaWanda shops! These two Matryoshkas are my first tries of Polymer clay Matryoshkas doll with painted details: eyes, hair and flowers are handpainted by me! Do you like them? If you do, check out my Matryoshkas set on my Flickr Gallery ... I regularly upload new photos! Something new in my Etsy shop! But in the meantime I've created something =) You can find my new creations on my Etsy shop! 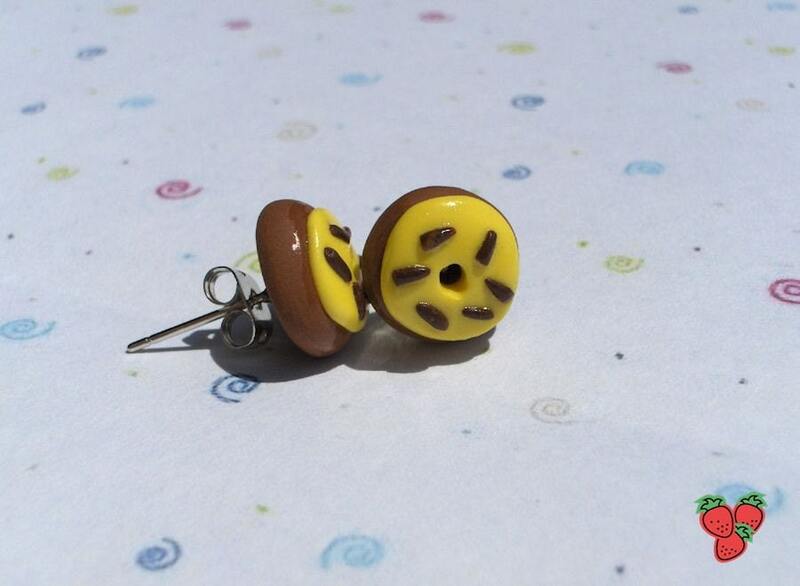 A couple of cute and sweet ear stud earrings: donuts with lemon cream and chocolate, made of FIMO (polymer clay) and varnished with a special gloss lacquer for polymer clay after baking. 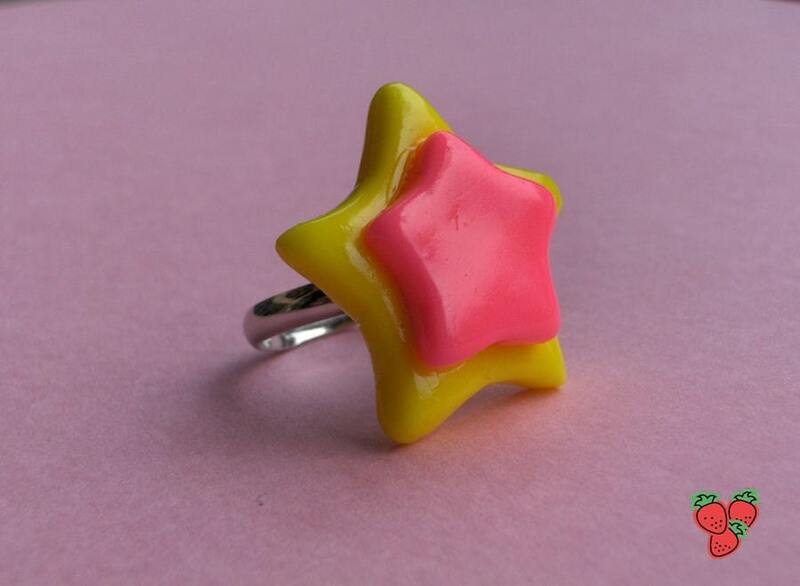 Finally, a cute adjustable ring (in metal but nickel free), with yellow and pink fluo stars made of FIMO (polymer clay), and varnished with a special gloss lacquer for polymer clay after baking. The stars DON'T glow in the dark. They are completely handmade, with NO moulds. A walk in the savanna, horn ethnic bracelet. New Dawanda item! Now I've to study for my exams, but before I show you something new: this is a very elegant and ethnic bracelet made with horn beads. 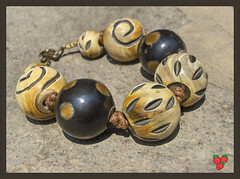 Between each bead there is light brown string knot... this is the new entry on my DaWanda shop! If you are interested in buying and you haven't a DaWanda account, feel free to contact me at petitefraise@live.it ! To see the image larger on its Flickr page, please click on it. Adesso devo riprendere a studiare per i miei esami, ma prima vi mostro qualcosa di nuovo: questo è un braccialetto etnico molto elegante, con perle in corno e cordino marrone. Tra una perla e l'altra c'è un nodo... potete trovarlo nel mio negozietto DaWanda , ma se non avete un account DaWanda e siete interessati all'acquisto, scrivetemi pure all'indirizzo e-mail petitefraise@live.it ! Per vedere l'immagine più grande nella sua pagina Flickr, cliccateci sopra.